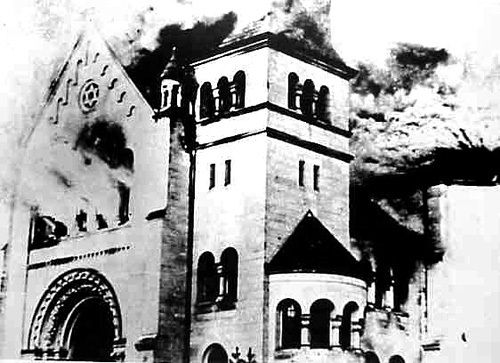 In one night of terror, German mobs destroyed what they could of the Jewish presence. 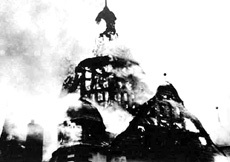 In November 1938, an event occurred which was called "Kristallnacht," or the "Night of Broken Glass." The Germans were looking for a way to get rid of their Jews. Send them anywhere, but just get them out. 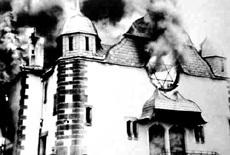 Many Jews of Polish origin had come to Germany because conditions were so much better there than in Poland. The Germans saw this as a group to be easily gotten rid of. They were rounded up and, on one cold, rainy night in the fall, they were herded and beaten across the border. 12,000-17,000 Polish Jews, who were not considered Poles any more, found themselves in a small border town in Poland that had a population of 6,000 Poles. There was no place to put them, so they were stuck into military stables, under impossible conditions. They hadn’t eaten for days. 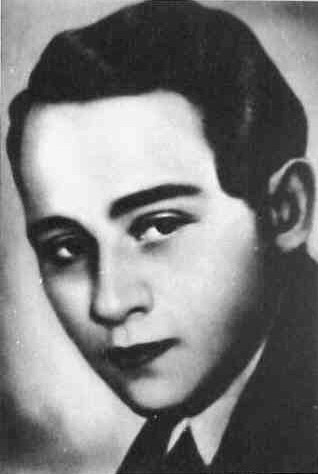 Two of these Polish Jews had a son named Henry Grynszpan, who was living in Paris. The boy was frantic with concern for his parents and felt that he needed to "do" something to publicize to the world what was happening to the Jews in Germany. This seventeen-year-old boy got a gun, walked to the German embassy in Paris, and shot the first man he saw– an embassy official named Ernst Von Rath. Von Rath died. This triggered a "spontaneous" uprising against the Jews. It had actually been planned for quite a while, and this was just the pretext to put the plan into action. In one night, 1,350 Jewish synagogues were burnt to the ground or destroyed; over 91 Jews were killed; 30,000 Jews were thrown into concentration camps; 7,000 Jewish businesses were destroyed; and thousands of Jewish homes were ransacked. Germany did not produce plate glass at the time, and it took Belgium’s total plate glass production about 6 months to replace all the windows that were broken. To top everything off, the Jews were charged 1 billion Deutsch Marks to pay for the damages. Every town, every place had its little "shteibel." 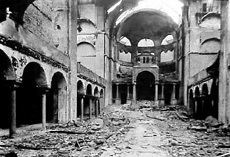 Germany was filled with beautiful, old synagogues that had been there for centuries. And overnight it all went up in flames. The Jews finally got the message: It was time to leave. But … where to go?